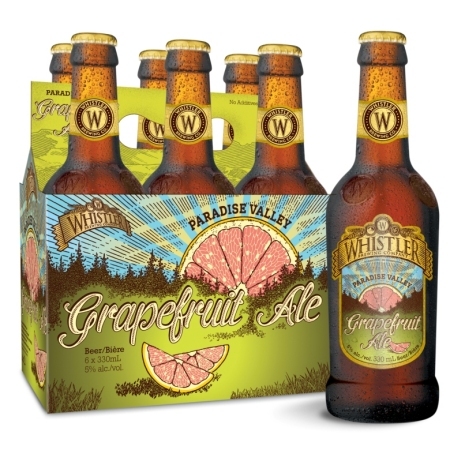 WHISTLER, BC – Whistler Brewing has announced the return of summer seasonal Paradise Valley Grapefruit Ale, with this year’s batch appearing in a new package. Described as “a refreshing grapefruit aromatic, lightly hopped beer, with a clean citrus finish,” Paradise Valley was debuted last summer in 650 ml bottles, but is now being offered in six packs of 330 ml bottles, as well as in the new edition of Whistler’s Travel Pack mixed package. Six packs of Paradise Valley Grapefruit Ale and the 12 bottle Travel Pack are available now in both government and private liquor stores throughout British Columbia. I live in Alberta. And unfortunately only get to visit bc a couple times a year… Yes it’s sad.. But the last time I was there I found ur beer at a pub in Nelson. (I can’t remeber the name…). But the next day I was sure to go grab a case of your grapefruit beer to take home with me! The liquor store I found it in only had 3- 6 packs. So naturally I took all of it..! But I’m having withdrawals and need this delivered to Alberta! Red deer preferably! Can you help me! ?